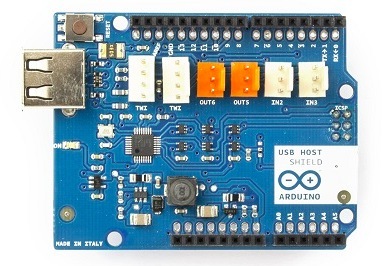 Two new Arduino products are available starting today from the Arduino Store. Read below for details! – it is based on the MAX3421E, which is a USB peripheral/host controller containing the digital logic and analog circuitry necessary to implement a full-speed USB peripheral or a full-/low-speed host compliant to USB specification rev 2.0. – it can be used with the “USB Host Library for Arduino” hosted by Oleg Mazurov and Alexei Glushchenko from circuits@home, Kristian Lauszus and Andrew Kroll on GitHub (click to download zip). If you want to see how to use it, take a look at this tutorial from Officine Arduino which used it to add wireless to an RC Car. – burn the bootloader on your Arduino, so you can recover it if you accidentally corrupt the bootloader. – when you use a new ATmega microcontroller in your Arduino, and you need the bootloader in order to upload a sketch in the usual way. 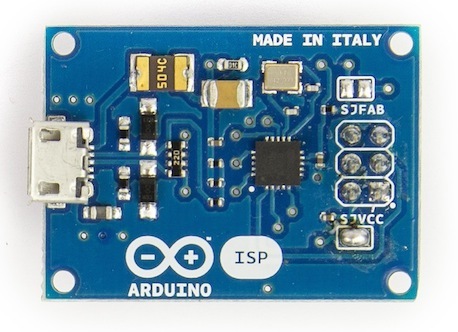 Learn how to program an ATtiny and to read your Arduino built-in EEPROM using ArduinoISP in the tutorials on Scuola. This is really wonderful indeed. when you use a new ATmega microcontroller in your Arduino, and you need the bootloader in order to upload a sketch in the usual way.